Need more information about adventures, itineraries, lodging or dining options in the Alpena Area? Serving the Alpena region, the Alpena Area Convention & Visitors Bureau assists visitors (leisure travelers, business travelers, groups, etc.) with local information: things to do, sights to see, experience to collect, and local flavor to savor. Contact us in advance for planning resources, guidance, and advice to make your trip successful. 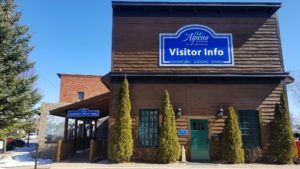 The Visitor Welcome Center is staffed with local experience guides who can tailor an Alpena adventure especially for you. Site Visits for event planners can be accommodated at any time with advance scheduling. The Welcome Center is also a resource for local residents who wish to assist friends, relatives, and colleagues.